It's quite possible that someone has been reading your messages, emails, listening to your phone calls, and monitoring your activities at work. Recently, European Court had ruled that the Employers can legally monitor as well as read workers' private messages sent via chat software like WhatsApp or Facebook Messenger and webmail accounts like Gmail or Yahoo during working hours. So, if you own a company or are an Employer, then you no need to worry about tracking your employees because you have right to take care of things that could highly affect your company and its reputation, and that is Your Employees! Since there are several reasons such as Financial Need, Revenge, Divided Loyalty or Ego, why a loyal employee might turn into an INSIDER THREAT. Insider Threat is a nightmare for Millions of Employers. Your employees could collect and leak all your professional, confidential data, upcoming project details to your Rivals and much more that could result in significant loss to the company. According to the latest threat report conducted by the Vormetric, it is analyzed that 40% of organizations experienced a data breach last year, out of which 89% felt that their organizations were vulnerable to insider attacks. In March 2010, an IT Developer in the British Airways had been accused of leaking the Airport Security procedures for terrorist-related activities. From this example, you could figure out that the Insider Threat may take up its devilish dimension to lead to a dangerous situation. How Can Companies Monitor their Employees iPhone? Some strategies could be benefited for the employers by tailing up employee’s daily activities during the work hours. Major tech companies like Symantec and IBM have a history of maintaining a threat report to their employees by a dedicated device (BYOD) that regularly updates the Employee’s Professional Network usage, such as downloads or other social networking sessions, in a statistical method. Apple also provides a similar feature to companies for monitoring their employee's activities via work-issued iPhones that are set up with an organization's Mobile Device Management (MDM) server. This allows employers to remotely upgrade, control, track and supervise various aspects of the iPhone’s software. With the release of its upcoming iOS 9.3 version, Apple will provide a bunch of new features to employers, allowing companies to monitor their employees activities more deeply. The new mobile operating system would let the company’s IT administrators enforce home screen layouts on your work-issued iPhones as well as lock apps to your home screen so that you can not be moved to a different folder or a page. The upcoming iOS 9.3 will also allow companies to hide or blacklist specific applications that it does not want their employees to download. So in short, your favorite games like Candy Crush or Angry Birds that your organization does not wish you to play during work hours could be blocked. If this is not enough, your company will now also be able to enforce notification settings so that you will not be able to ignore your employers notifications. So next time if your company calls you to report in a short notice period, you just can not say you have not read the message, neither you can give excuses that you missed it somehow. These are some pretty significant changes the upcoming iOS 9.3 will bring in employers perspective. Interestingly, the upcoming iOS 9.3 operating system empowers the employees as well. Let’s talk about what features the OS will offer employees. The iOS 9.3 version will tell employees whether their employers are monitoring their company-issued iPhones. 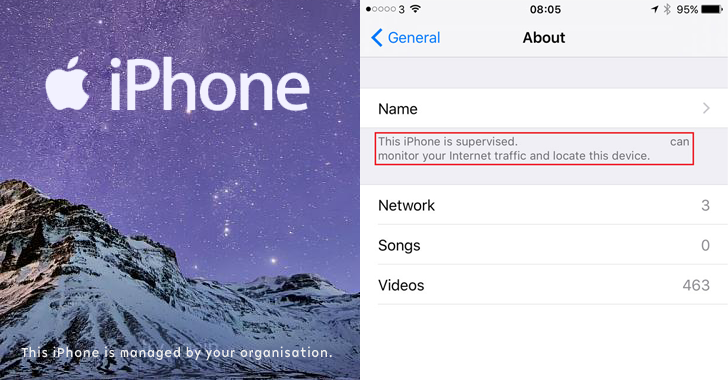 Your iPhone’s lock-screen will display "This iPhone is managed by your organization" near the bottom of the screen, hindering you to use your phone for personal choice apart from professional usage. Additionally, If you’ll check the "About" menu in the Setting, it will reveal what all data had been supervised by your Employer. Such notification was not available in the previous version of iOS. This is the first time Apple is allowing its users to check whether their organization is keeping tabs on them. Surely employees will love this new feature in upcoming iOS 9.3, but the companies may hate this features as their stand will be exposed for tracking their employees. These new features would mark its presence in the upcoming iOS 9.3 release on March 21, 2016.